Islamic philiosophy is the philosophy that is practiced in countries where Islam has a strong influence on society. The product of islamic philiosophy is an Islamic society. Philiosohy, as a "project of independent philosophical inquiry" began in Baghdad in the middle of the eighth century. 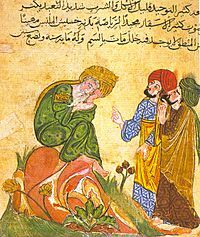 Early islamic philiosophy refers to the time period of the 8th to the 12th century. This time is often called the Islamic Golden Age. There are two main branches of philiosohpy, Kalam, and Falsafa. Falsafa is a word that comes from Greek; it refers to the kind of philiosophy much like it was done in Ancient Greece. Kalam literally means "Speech": it uses dialectic in phliososphy. One of the first "discussions" was about free will, a school called "Qadar" said there was free will, another school called the Jabarites said there was not. Islamic philosophy Facts for Kids. Kiddle Encyclopedia.